Five children, ages 5 to 15, were killed and two adults were hurt in Bowie early Saturday after a car they were riding in crashed into several trees and spun into a field, police say. Maryland State Police believe the children riding in the back of a 2005 Chrysler Pacifica, an SUV, were not restrained properly as they headed north on Route 301 near Pointer Ridge Drive. The driver, 32-year-old Dominique R. Taylor, lost control of the car about 4:30 a.m. and veered off the side of the road, hitting several trees, a preliminary investigation revealed. Police say the five children were thrown from the car as it hit the trees and spun out into a field. London Dixon, 8, and Paris Dixon, 5, both children of Taylor who lived in Bowie and attended Northview Elementary School, and Zion Beard, 14, Rickelle Ricks, 6, and Damari Herald, 15, from D.C, were pronounced dead at the scene. Taylor was sent to a hospital. Her condition is unclear. Cornell D. Simon, 23, of Oxon Hill, is in critical condition, according to police. It appears all five children were riding in the backseat, and police said the Chrysler Pacifica only had one row of seats in the rear. Photos from the scene showed extensive damage to the car. Police have not yet ruled out any possible causes of the crash, but a reconstruction team is working to determine what happened. Roads throughout Maryland were icy, but police haven't confirmed whether weather contributed to the crash and said the state salted roads. 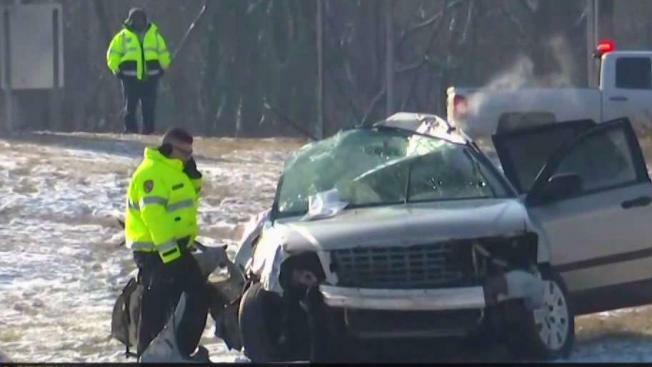 "Every collision where we lose life is a tragedy," said Maryland State Trooper Capt. Daniel Pickett. "And where children are involved, it's more of a tragedy." Maryland Gov. Larry Hogan and Prince George's County Executive Angela Alsobrooks expressed their condolences in Twitter posts. My thoughts and prayers are with the family members of the five children killed, and the two adults being treated for their injuries, following a tragic accident on Route 301 early this morning. PGPD is assisting @MDSP as they thoroughly investigate this incident. The road was closed for more than seven hours after the crash but has since reopened.